In the age of international telecommunications, global migration and the emergence of the information economy, how can class conflict and property be understood? Drawing from political economy and concepts related to intellectual property, The Telekommunist Manifesto is a key contribution to commons-based, collaborative and shared forms of cultural production and economic distribution. Proposing “venture communism” as a new model for workers’ self-organization, Kleiner spins Marx and Engels’ seminal Manifesto of the Communist Party into the age of the internet. As a peer-to-peer model, venture communism allocates capital that is critically needed to accomplish what capitalism cannot: the ongoing proliferation of free culture and free networks. 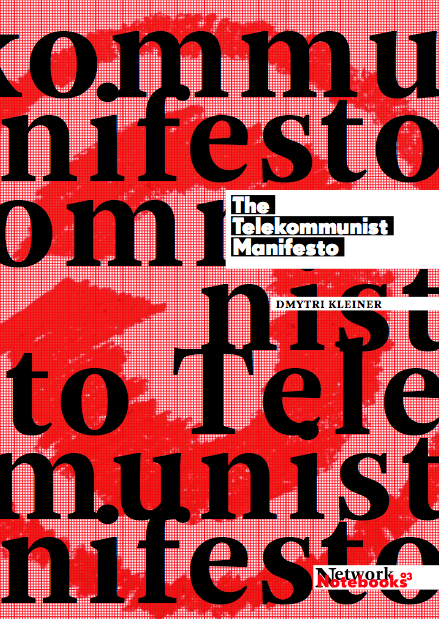 Encouraging hackers and artists to embrace the revolutionary potential of the internet for a truly free society, The Telekommunist Manifesto is a political-conceptual call to arms in the fight against capitalism. Both venture communism and copyfarleft have, as their goal, the creation of a productive commons that producers can use to accumulate mutual wealth, and thus work towards realizing their historic role of creating a society free of economic classes.